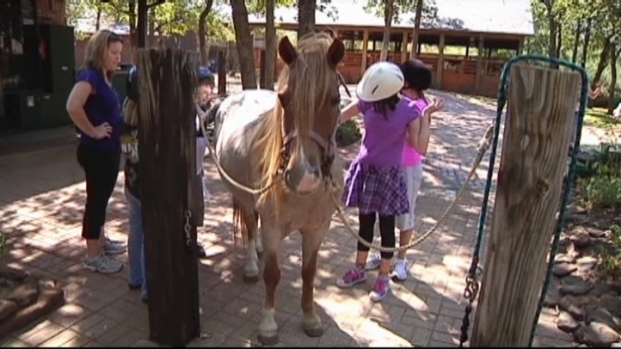 This summer's heat wave has cost a North Texas riding center a fortune. SpiritHorse Therapeutic Center, which offers equine therapy to hundreds of children and adults, is overwhelmed by riders and expenses. Charles Fletcher, who started the organization, said it is $25,000 over budget . SpiritHorse is already using its winter hay reserves. The drought has pushed one North Texas riding center to the limit. "We normally start feeding hay in November," Fletcher said. "We had to start feeding in July." "We also went through most all of our grain that we had for winter, so we are way behind financially on our inventory of hay and grain," trainer Jennifer Mathis said. SpiritHorse offers its private equine therapy sessions free of charge and relies on donations. Clients say they look forward to the equine therapy all week. Collin Holz said SpiritHorse has been a blessing for her 4-year-old daughter, Hayden. "This is one of the few things she knows that puts her in a better place," she said. Each time the 4-year-old saddles up, her disabilities become less apparent, Holz said. "We could instantly see a difference of what the movement and riding a horse did for at least our daughter," she said. The center serves hundreds of North Texans each week. Fletcher said there are now more than 50 spirit horse centers worldwide. "We've heard 84 children speak the first words of their lives on our ponies," he said. "We have seen 53 children walk, most of which the medical profession said would never walk." All of the donation information can be found on the front page of their website spirithorsetherapy.com or you can call (940)497-2946.